A visit to the Fort De Bernia is must if you are a nature lover and eager to know about historical places. The military design of this place attracts a lot of tourists throughout the year. The nice hiking trail here consists of a lot of primitive caves, terraces along with a cave. The guides generally give valuable inputs regarding the livestock and history of this region. You will love the view of the Xorta mountain range while climbing up alongside Aitana range. 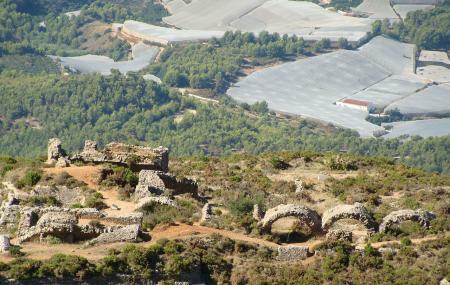 Fort De Bernia has got a lot of native flora such as palm, pine and oak gardens. You must not miss the stunning views of the Marina Naja. Interesting ruins of a fort with a few interpretive signs. Adds to an already excellent circuit round the mountain. Great walk up from the Pinos direction. Not at all difficult but some of the best mountain views I have ever seen The fort is a collection of stone ruined arches, not so much, but that isn't why you come here. You can carry on round the mountain and come back to where you started, which is a bit harder, but still not a demanding walk.